About 12 species, natives of the Old World and temperate South America. Type species: Briza minor L.
Perennial; ligule 1/2" long or less, truncate; spikelets 5-12-flowered, 2"-2 1/2" long. Annual; ligule 1" long or more, acute; spikelets 3-6 flowered, 1"- 1 1 /2" long. Briza media L. Sp. PI. 70. 1753. Smooth and glabrous, culms 6'-2° tall, erect, from a perennial root, simple. 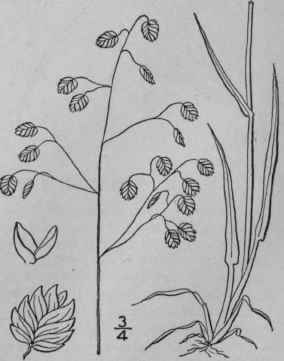 Sheaths shorter than the internodes; ligule \" long or less, truncate; blades 1'-3' long, 1"-3" wide; panicle 1 1/2'-5' in length, the capillary branches spreading or as-sending, 1'-2 1/2' long; spikelets 2"-2 1/2" long, orbicular to deltoid-ovate, 5-12-flowered; scales scarious-margined, the lower ones about 1" long; flowering scales \"-\\" long, broader than the lower ones, widely spreading. In fields and waste places, Ontario to Massachusetts and Rhode Island. Naturalized from Europe. Native also of Asia. Maidenhair, Shakers, Cow-quake, Lady's-hair, Wag-wanton. Pearl-, Fairy-, Dodder-Dithering- or Jockey-grass. June-July. Briza minor L. Sp. PI. 70. 1753. Smooth and glabrous, culms 4-15' tall, erect from an annual root, simple. 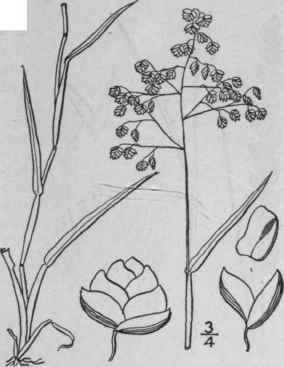 Sheaths shorter than the internodes; ligule 1"-3" long, acute; blades 1'-5' long, 1 "-4" wide, sometimes scabrous; panicle 2-5' in length, open, the capillary branches spreading or ascending, 1-2 1/2 long; spikelets 3-6-flowered, 1"-1 1/2" long, about 2" broad, truncate at the base; scales scarious-margined, the lower ones about 1" long; flowering scales much broader and deeply saccate, about 2" long. In ballast and waste places, New Jersey to Virginia; common in California, and widely distributed in tropical America. Adventive or naturalized from Europe. June-July.